COACH STEVE helped found the East High School Mountain Bike team in 2010 – and yes, that is his high school senior picture. Steve has been an integral part of the Colorado High School Cycling League and has volunteered hundreds of hours to the league over the years. In 2017 Steve was voted ‘Volunteer of the Year’ by the league. When did you first become passionate about riding: After watching the Coors Classic road races. Why become a Coach? : Someone else was trying to start the team and fell off. I picked it up because it seemed important. Favorite thing about East MTB: I love the family atmosphere and Team Spirit this became. When I’m not biking: Spending time with my wife, Becky, dog Avery, skiing, and attempting to play guitar. 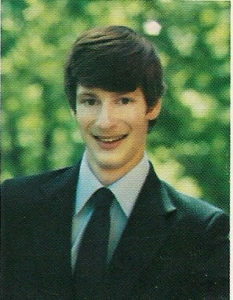 What was I like in HS: I was a quiet, geeky guy that ran Cross Country, Track and worked at a retail store called LaBelles. Favorite Movie: Guardians of the Galaxy is a recent Favorite. Why someone should join East MTB: We have a wonderful team that likes to spend time together. You have the opportunity to learn a lifelong sport that provides a window into nature and an escape from the daily grind. Favorite Trail: Apex Park in Jefferson County is challenging, but on a good day can be ridden. Oscar: I’d thank Becky for keeping me grounded and supporting me. Anyone for a day: Jimmy Carter because of his giving nature for so many years. COACH LESLIE is an Colorado native and outdoor junkie. She spends the warmer months on a bike and manages to get in 100+ days of skiing during the colder months. She has an awesome attitude and is a huge inspiration to the Riders. Why did you become an MTB coach: My company, 8Z real estate believes in giving back, so I started as a monetary sponsor of the team. Then I was invited to ride with the team and I was hooked. I love seeing the riders grow individually and as a team. What’s your favorite thing about East MTB: that it is a vibrant, growing sport! I wish we had had such an option when I was in school. When I’m not biking: Easy answer, skiing. I just returned from skiing in Northern India! What were you like in high school: I could have used more direction. I got good grades, but might have done better with more structure. Favorite movie or TV show: Chopped on the Food Network. If you won an Oscar, you’d most definitely have to thank: My cousin who is a producer in Hollywood because that would be the only reason I would ever have the opportunity to win an Oscar. 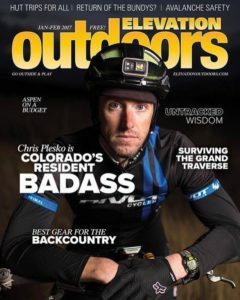 Coach Chris Plesko was the 2017 Elevation Outdoors Resident Badass – Check it out! His weapon of choice is a fully rigid single speed. His idea of fun is punishment in the form of ultra long endurance rides and races (500 mile Colorado Trail, 2745 mile Tour Divide, 200 mile Fat Pursuit and many others). Chris brings his wealth of experience and background as a pro racer to every practice and race. When did you first become passionate about biking? I first became passionate about cycling in high school. 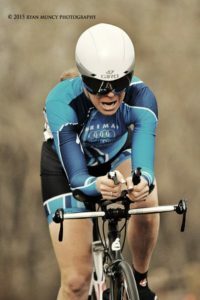 I wanted to compete in a triathlon and started cycling and running until I could learn how to swim. At first I borrowed a road bike and then managed to buy a used one of my own. A bike shop owner hired me to assemble bikes and do sales and since then I’ve been hooked! Triathlons gave way to mountain bikes and XC gave way to endurance events and then ultras. Day job: I’m a middle school math teacher at Bear Valley International School here in DPS. Why did you become an MTB coach? I had watched the high school cycling leagues across the country grow from nothing but I didn’t really know how to get my foot in the door. One day in the parking lot of Lookout Mountain I ran into Steve wearing his East HS vest. We struck up a conversation and I was so excited to learn that DPS had a team in the league. I told him I’d love to help out and I’ve been involved ever since. Favorite thing about the league: Everyone just seems so happy to ride bikes. Whether kids are racing at the front of their class or just getting into the sport it’s such a positive environment. I wish that something like this existed when I was 16. Cycling certainly wasn’t popular in my area or high school and I only knew a couple other kids my age who still rode bikes. When I’m not biking I’m: Working or hanging out with my wife and two boys. Ben is 4 and JJ is 7. They both love to ride. What were you like in high school? In high school I loved sports and (usually) worked hard in class. I played sports (soccer, XC, basketball, swimming, and track) every season. On the weekends I worked at the bike shop or went riding. I graduated early after 3 years and came out to University of Colorado-Boulder to study mechanical engineering and join the CU Triathlon team. Favorite movie or TV show: I don’t watch a ton of TV but throughout a few injuries The Office keeps me laughing and distracted from the fact that I can’t ride. Why should someone join our MTB team? We have so much fun whether it’s on training rides or out at the races. It’s such a positive community. I look forward to every event. Favorite CO bike trail: This has varied so much through the years. Lately I’m super addicted to the riding at Buffalo Creek. My ride: I ride a rigid Pivot LES singlespeed 29er! If you won an Oscar, you’d most definitely have to thank my wife because she is an incredible support for me. When I’m training hard she picks up all the slack that makes working full time, coaching, and racing ultras at a high level possible. Anyone for a day: Keeping with our MTB focus I’d love to be Julien Absalon for a day. I’m curious what it’s like to race at the top of the World Cup level and he’s been at it for so many years. He always seems to have great form but is also positive and gracious at the races. Racing with class and composure he is a role model.